If this goes through, it may spell doom for disc by mail services. Blockbuster and Netflix disc-by-mail subscribers may be in for some bad news - movies are going to be getting to you even slower. This isn't something you can blame on Netflix or Blockbuster though. This one goes to the USPS. Apparently, our postal service isn't doing so well. They've been losing money hand over fist and there doesn't seem to be any sign of it stopping. They've talked about ending Saturday deliveries but now there's an option on the table that would make disc-by-mail incredibly inconvenient. 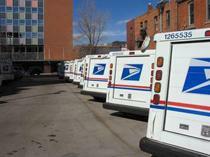 The proposal would put an end to next-day delivery of First Class mail, instead allowing up to 72 hours for your letter or disc to get to its destination.